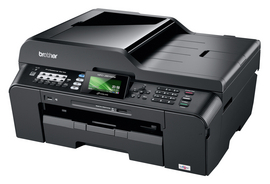 Buy Brother mfc j6510dw with CISS and make 30 times more quality prints for the same money! Pay only 0.04 USD for A-4 full color imprint! This line of the multifunctional devices with A3 format belongs to a new generation, it operates with increased speed and provides quality and improved printing, and also it supports new features of the A3 format. This is the most important innovation in the MFD with A3 format manufacturing, which has been provided by the Brother company since 2008. 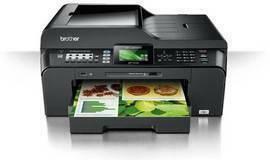 That year Brother company released the first compact inkjet multifunctional devices (MFP) Brother. Its targets were small and medium enterprises and offices, and also it was offered for work at home. The Brother MFC-J6510DW Printer has the same functions as The Brother MFC-J6910DW, but furthermore it has a lower paper tray due to which you could download 500 sheets of any size up to A3 format and including (it has 2 trays for 250 sheets each), with enlarged internal memory of 192 MB, and the 35-sheet ADF supports duplex scanning. It dimensions were increased in comparison with the previous model, it is 540x489x331 mm and its weight is 18.5 kg. A set of ink tanks. A set of samples for testing print in A3 format. The case of the MFP is made of rather high quality black plastic, and its details and junctions do not contain any dross or rough casting materials markings. With all the set of functions its weight is a little more than 15 kg, and its size is just 540x489x257 mm. The upper cover contains an unfolding tray for the document feeder. It could scan A3 size papers and hold up to 35 sheets of standard density.The device provides scanning via a take-off assembly − in this case, the scanner carriage remains in place and paper is moved. The scanner compartment is disposed under the cover, and there is a narrow section for scanning on the left, and it is needed when the take-off assembly is used. The background color is white, as in flatbed and with a take-off assembly scanning. This lets you join together several small documents into one document of larger format during flatbed scanning, and there will be no black frames around each of them. The Printer Brother MFC-J6510DW has two print trays. One of them is for the ADF for 250 standard pages, and the other one is for cartridge photo paper, for hand feeding and other rare supplies. There is a service hatch for the jammed paper extraction. It is situated at the back panel under the manual feeding tray. Regarding service hatches, it worth mentioning, that the scanner compartment is also a lid itself. Under it we can access another set of rollers of the printing mechanism. The Multifunctional device MFC-J6510DW has two covers for access to the printing mechanism. It is very convenient for operation and service. Nevertheless, the engineers remembered one more important thing, that it was a tray for the printed sheets. This design characteristic was distinguished by the company representatives at the presentations of this printer in such cities as New York, Washington, Boston, Detroit, Chicago . Multifunctional Printer Brother MFC-J6510DW has USB 2.0 port for common flash drives, memory card reader for standard SD / MMC and MS / MS Duo cards. Due to these functions you will have a wide possibility of connection different data carriers. Next to the card reader it has ink compartment. If you open the cover you will see a safety guard protection of print head from drying. Of course, you will have to remove it to set up the ink tank. In this printer only four colors (black, yellow, cyan and magenta) are used. 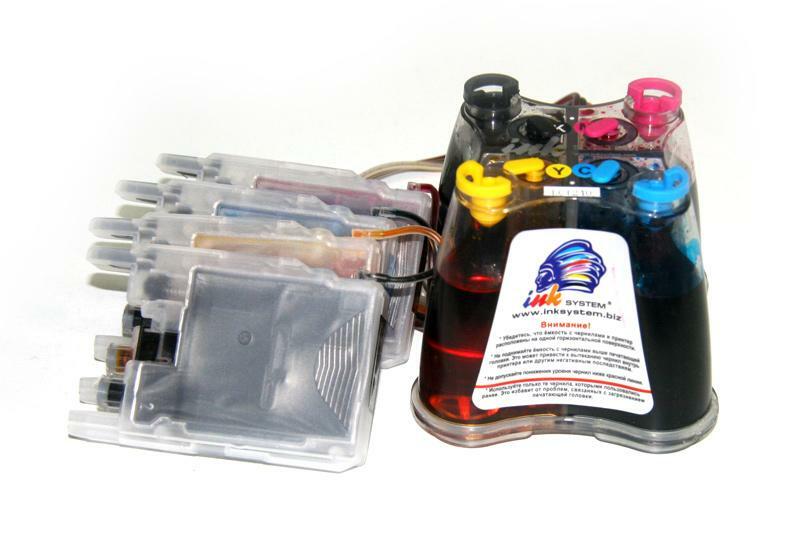 It's an ordinary color combination for such inkjet printers, which has no claims to high typographic quality. It provides easy and handy installation of the ink tanks from the supply, you could do it without any effort. These tanks should be installed into appropriate place until вЂњclickingвЂќ. The process is similar to the printer Brother DCP-165C . You should not throw the protective cap, there is a corresponding cleft for it under the service cover вЂ“ an excellent economy of the manufacturer.